This is Florida’s beloved firespike plant (odontonema strictum). It is one of my favorite plants. It isn’t edible for people, but it sure feeds the hummingbirds. They really, really love it. We had a hummingbird hanging out at this plant all day, every day, for many months. I have this planted in front of all our windows. 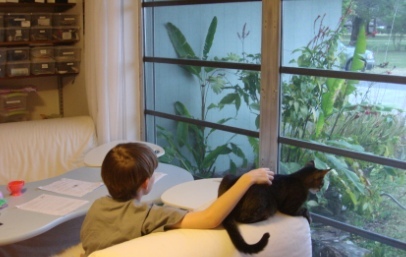 My son does his homeschooling at a table in front of a huge window with this plant as his view. He watches the hummingbird while he works. My son said a new hummingbird appeared yesterday while he was working. I tell everyone I know to plant this if they want hummingbirds in their yard. I planted this at a house we used to live in that was completely covered under an oak hammock. The entire yard was in dense shade. 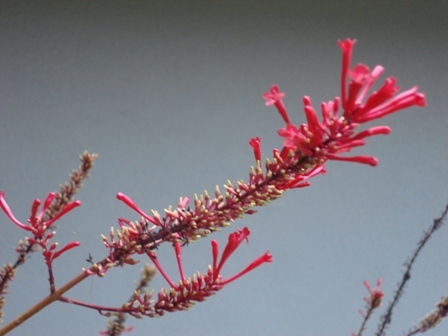 This firespike plant still bloomed profusely most of the year and the hummingbirds were all over it all the time. When we moved from that house I dug up some small seedlings and carried them with me to the new house. When the firespike bloomed, the hummingbirds arrived. We’ve had many nights of freezing temperatures in zone 9b this year. My firespike isn’t as green as it usually is, but it hardly looks damaged. I believe the overhang on the side of the house protected it. If it does freeze back to the ground, it will usually grow back. In the ten years I’ve grown this plant in my yard I have never seen it harbor any pests. Firespike grows to a height of about six feet. There are many other plants that attract hummingbirds, but this one is a must have for a Florida yard.